ACRN is an open source reference hypervisor (HV) running on top of Intel Apollo Lake platforms for Software Defined Cockpit (SDC) or In-Vehicle Experience (IVE) solutions. ACRN provides embedded hypervisor vendors with a reference I/O mediation solution with a permissive license and provides auto makers a reference software stack for in-vehicle use. The SDC system consists of multiple systems: the instrument cluster (IC) system, the In-vehicle Infotainment (IVI) system, and one or more rear seat entertainment (RSE) systems. Each system runs as a VM for better isolation. driving speed, engine RPM, temperature, fuel level, odometer, trip mile, etc. rear-view camera(RVC) and surround-camera view for driving assistance. Mobile devices connection for calls, music and applications via voice recognition and/or gesture Recognition / Touch. ACRN supports guest OSes of Clear Linux OS and Android. OEMs can use the ACRN hypervisor and Linux or Android guest OS reference code to implement their own VMs for a customized IC/IVI/RSE. Recommended Memory: 4GB, 8GB preferred. ACRN is a type-I hypervisor, running on top of bare metal. It supports Intel Apollo Lake platforms and can be easily extended to support future platforms. ACRN implements a hybrid VMM architecture, using a privileged service VM running the service OS (SOS) to manage I/O devices and provide I/O mediation. Multiple user VMs can be supported, running Clear Linux OS or Android OS as the user OS (UOS). Instrument cluster applications are critical in the Software Defined Cockpit (SDC) use case, and may require functional safety certification in the future. Running the IC system in a separate VM can isolate it from other VMs and their applications, thereby reducing the attack surface and minimizing potential interference. However, running the IC system in a separate VM introduces additional latency for the IC applications. Some country regulations requires an IVE system to show a rear-view camera (RVC) within 2 seconds, which is difficult to achieve if a separate instrument cluster VM is started after the SOS is booted. 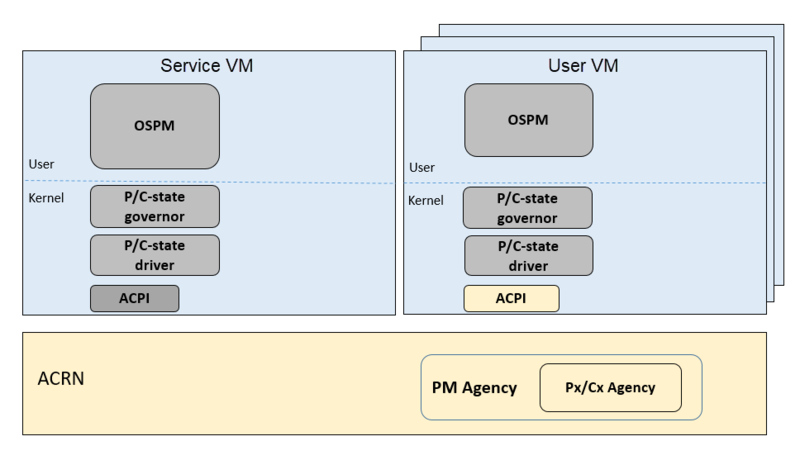 Figure 35 shows the architecture of ACRN together with IC VM and service VM. As shown, SOS owns most of platform devices and provides I/O mediation to VMs. Some of the PCIe devices function as pass-through mode to UOSs according to VM configuration. In addition, the SOS could run the IC applications and HV helper applications such as the Device Model, VM manager, etc. where the VM manager is responsible for VM start/stop/pause, virtual CPU pause/resume,etc. para-virtualized, requiring front-end drivers in the UOS to function. Pass-through device: A device passed through to UOS is fully accessible to UOS without interception. However, interrupts are first handled by the hypervisor before being injected to the UOS. Mediated pass-through device: A mediated pass-through device is a hybrid of the previous two approaches. Performance-critical resources (mostly data-plane related) are passed-through to UOSes and others (mostly control-plane related) are emulated. The device model (DM) is a place for managing UOS devices: it allocates memory for UOSes, configures and initializes the devices shared by the guest, loads the virtual BIOS and initializes the virtual CPU state, and invokes hypervisor service to execute the guest instructions. The following diagram illustrates the control flow of emulating a port I/O read from UOS. Figure 36 shows an example I/O emulation flow path. When a guest executes an I/O instruction (port I/O or MMIO), an VM exit happens. HV takes control, and executes the request based on the VM exit reason VMX_EXIT_REASON_IO_INSTRUCTION for port I/O access, for example. HV will then fetch the additional guest instructions, if any, and processes the port I/O instructions at a pre-configured port address (in AL, 20h for example), and place the decoded information such as the port I/O address, size of access, read/write, and target register into the I/O request in the I/O request buffer (shown in Figure 36) and notify/interrupt SOS to process. The virtio and HV service module (VHM) in SOS intercepts HV interrupts, and accesses the I/O request buffer for the port I/O instructions. It will then check if there is any kernel device claiming ownership of the I/O port. The owning device, if any, executes the requested APIs from a VM. Otherwise, the VHM module leaves the I/O request in the request buffer and wakes up the DM thread for processing. DM follows the same mechanism as VHM. The I/O processing thread of the DM queries the I/O request buffer to get the PIO instruction details and checks to see if any (guest) device emulation modules claim ownership of the I/O port. If yes, the owning module is invoked to execute requested APIs. When the DM completes the emulation (port IO 20h access in this example) of a device such as uDev1, uDev1 will put the result into the request buffer (register AL). The DM will then return the control to HV indicating completion of an IO instruction emulation, typically thru VHM/hypercall. The HV then stores the result to the guest register context, advances the guest IP to indicate the completion of instruction execution, and resumes the guest. MMIO access path is similar except for a VM exit reason of EPT violation. Currently the only fully virtualized devices to UOS are USB xHCI, UART, and Automotive I/O controller. None of these require emulating DMA transactions. ACRN does not currently support virtual DMA. ACRN takes advantage of Intel Virtualization Technology (Intel VT). The ACRN HV runs in Virtual Machine Extension (VMX) root operation, host mode, or VMM mode, while the SOS and UOS guests run in VMX non-root operation, or guest mode. (We’ll use “root mode” and “non-root mode” for simplicity). The VMM mode has 4 rings. ACRN runs HV in ring 0 privilege only, and leaves ring 1-3 unused. A guest running in non-root mode, has its own full rings (ring 0 to 3). The guest kernel runs in ring 0 in guest mode, while guest user land applications run in ring 3 of guest mode (ring 1 and 2 are usually not used by commercial OS). Figure 37 shows an overview of the ACRN hypervisor architecture. A platform initialization layer provides an entry point, checking hardware capabilities and initializing the processors, memory, and interrupts. Relocation of the hypervisor image, derivation of encryption seeds are also supported by this component. A hardware management and utilities layer provides services for managing physical resources at runtime. Examples include handling physical interrupts and low power state changes. A layer siting on top of hardware management enables virtual CPUs (or vCPUs), leveraging Intel VT. A vCPU loop runs a vCPU in non-root mode and handles VM exit events triggered by the vCPU. This layer handles CPU and memory related VM exits and provides a way to inject exceptions or interrupts to a vCPU. On top of vCPUs are three components for device emulation: one for emulation inside the hypervisor, another for communicating with SOS for mediation, and the third for managing pass-through devices. The highest layer is a VM management module providing VM lifecycle and power operations. A library component provides basic utilities for the rest of the hypervisor, including encryption algorithms, mutual-exclusion primitives, etc. There are three ways that the hypervisor interacts with SOS: VM exits (including hypercalls), upcalls, and through the I/O request buffer. Interaction between the hypervisor and UOS is more restricted, including only VM exits and hypercalls related to trusty. SOS (Service OS) is an important guest OS in the ACRN architecture. It runs in non-root mode, and contains many critical components including VM manager, device model (DM), ACRN services, kernel mediation, and virtio and hypercall module (VHM). DM manages UOS (User OS) and provide device emulation for it. The SOS also provides services for system power lifecycle management through ACRN service and VM manager, and services for system debugging through ACRN log/trace tools. DM (Device Model) is an user level QEMU-like application in SOS responsible for creating an UOS VM and then performing devices emulation based on command line configurations. Based on a VHM kernel module, DM interacts with VM manager to create UOS VM. It then emulates devices through full virtualization in DM user level, or para-virtualized based on kernel mediator (such as virtio, GVT), or pass-through based on kernel VHM APIs. Refer to Device Model high-level design for more details. VM Manager is an user level service in SOS handling UOS VM creation and VM state management, according to the application requirements or system power operations. VM Manager creates UOS VM based on DM application, and does UOS VM state management by interacting with lifecycle service in ACRN service. Please refer to VM management chapter for more details. ACRN service provides system lifecycle management based on IOC polling. It communicates with VM manager to handle UOS VM state, such as S3 and power-off. 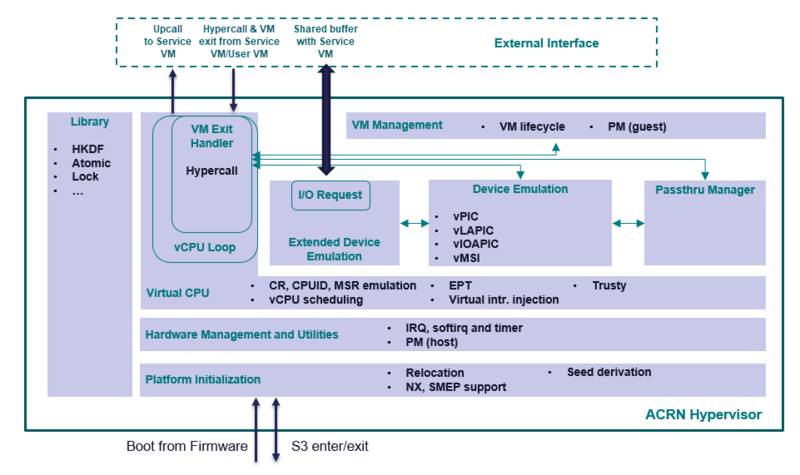 VHM (virtio & hypercall module) kernel module is an SOS kernel driver supporting UOS VM management and device emulation. Device Model follows the standard Linux char device API (ioctl) to access VHM functionalities. VHM communicates with the ACRN hypervisor through hypercall or upcall interrupts. Please refer to VHM chapter for more details. 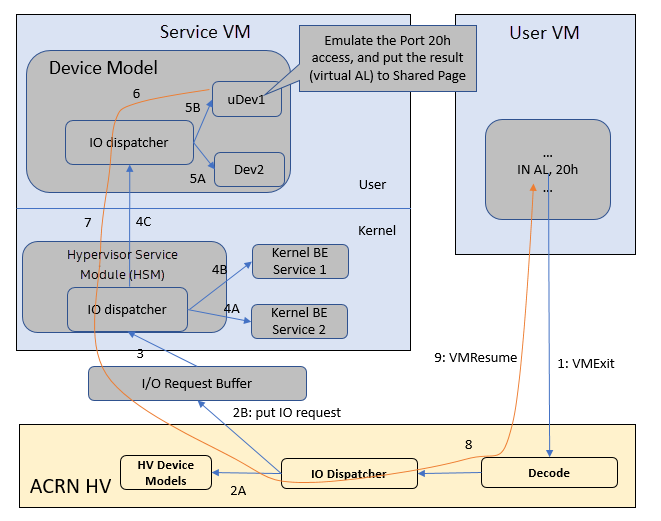 Kernel mediators are kernel modules providing a para-virtualization method for the UOS VMs, for example, an i915 gvt driver. ACRN Log/Trace tools are user level applications used to capture ACRN hypervisor log and trace data. 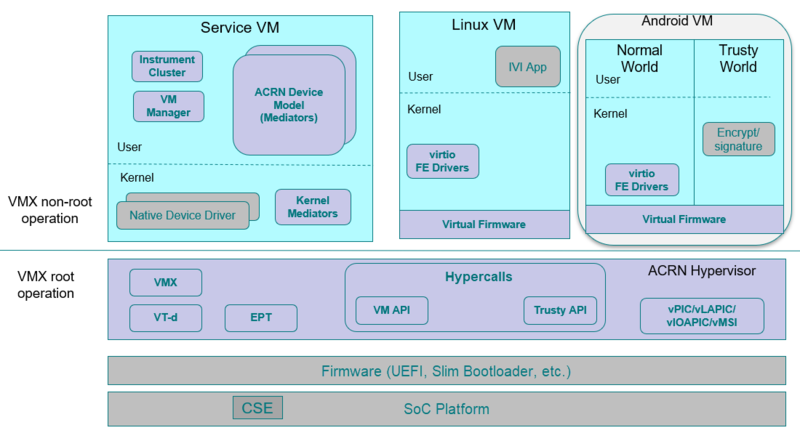 The VHM kernel module provides a middle layer to support these tools. Refer to Tracing and Logging high-level design for more details. Currently, ACRN can boot Linux and Android guest OSes. For Android guest OS, ACRN provides a VM environment with two worlds: normal world and trusty world. The Android OS runs in the the normal world. The trusty OS and security sensitive applications run in the trusty world. The trusty world can see the memory of normal world, but normal world cannot see trusty world. User OS’s memory is allocated by Service OS DM application, it may come from different huge pages in Service OS as shown in Figure 39. Virtual Slim bootloader (vSBL) is the virtual bootloader that supports booting the UOS on the ACRN hypervisor platform. The vSBL design is derived from Slim Bootloader. It follows a staged design approach that provides hardware initialization and payload launching that provides the boot logic. As shown in Figure 40, the virtual SBL has an initialization unit to initialize virtual hardware, and a payload unit to boot Linux or Android guest OS. The vSBL image is released as a part of the Service OS (SOS) root filesystem (rootfs). The vSBL is copied to UOS memory by the VM manager in the SOS while creating the UOS virtual BSP of UOS. The SOS passes the start of vSBL and related information to HV. HV sets guest RIP of UOS virtual BSP as the start of vSBL and related guest registers, and launches the UOS virtual BSP. The vSBL starts running in the virtual real mode within the UOS. Conceptually, vSBL is part of the UOS runtime. In the current design, the vSBL supports booting Android guest OS or Linux guest OS using the same vSBL image. 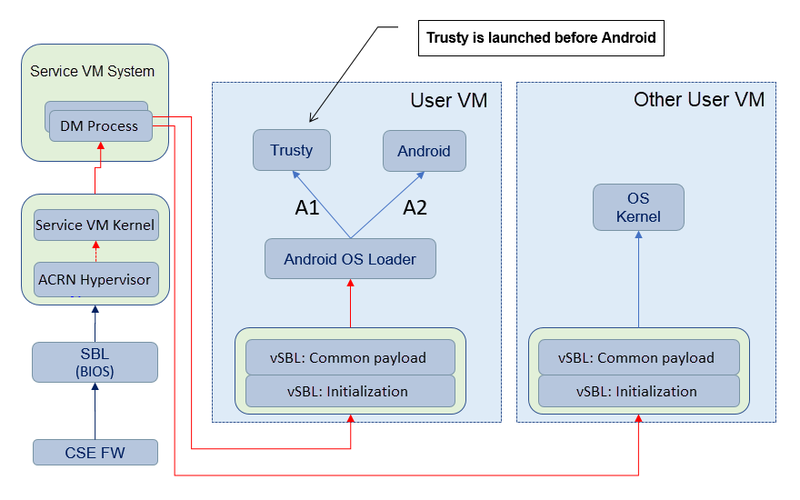 For an Android VM, the vSBL will load and verify trusty OS first, and trusty OS will then load and verify Android OS according to the Android OS verification mechanism. Each physical CPU is dedicated to one vCPU. Sharing a physical CPU among multiple vCPUs gives rise to multiple sources of interference such as the vCPU of one VM flushing the L1 & L2 cache for another, or tremendous interrupts for one VM delaying the execution of another. It also requires vCPU scheduling in the hypervisor to consider more complexities such as scheduling latency and vCPU priority, exposing more opportunities for one VM to interfere another. To prevent such interference, ACRN hypervisor adopts static core partitioning by dedicating each physical CPU to one vCPU. The physical CPU loops in idle when the vCPU is paused by I/O emulation. This makes the vCPU scheduling deterministic and physical resource sharing is minimized. Hardware mechanisms including EPT, VT-d, SMAP and SMEP are leveraged to prevent unintended memory accesses. The hypervisor does not unintendedly access the memory of SOS or UOS. Destination of external interrupts are set to be the physical core where the VM that handles them is running. External interrupts are always handled by the hypervisor in ACRN. 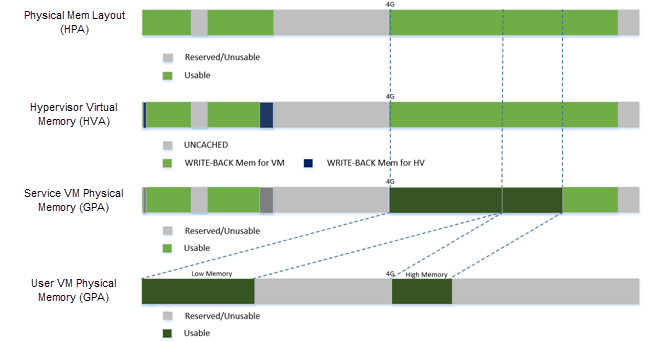 Excessive interrupts to one VM (say VM A) could slow down another VM (VM B) if they are handled by the physical core running VM B instead of VM A. Two mechanisms are designed to mitigate such interference. The destination of an external interrupt is set to the physical core that runs the vCPU where virtual interrupts will be injected. The hypervisor maintains statistics on the total number of received interrupts to SOS via a hypercall, and has a delay mechanism to temporarily block certain virtual interrupts from being injected. This allows SOS to detect the occurrence of an interrupt storm and control the interrupt injection rate when necessary. In ACRN, CPU P-state and C-state (Px/Cx) are controlled by the guest OS. The corresponding governors are managed in SOS/UOS for best power efficiency and simplicity. Guest should be able to process the ACPI P/C-state request from OSPM. The needed ACPI objects for P/C-state management should be ready in ACPI table. Hypervisor can restrict guest’s P/C-state request (per customer requirement). MSR accesses of P-state requests could be intercepted by the hypervisor and forwarded to the host directly if the requested P-state is valid. Guest MWAIT/Port IO accesses of C-state control could be passed through to host with no hypervisor interception to minimize performance impacts. ACRN supports ACPI standard defined power state: S3 and S5 in system level. For each guest, ACRN assume guest implements OSPM and controls its own power state accordingly. ACRN doesn’t involve guest OSPM. Instead, it traps the power state transition request from guest and emulates it. Figure 43 shows the basic diagram block for ACRN PM. The OSPM in each guest manages the guest power state transition. The Device Model running in SOS traps and emulates the power state transition of UOS (Linux VM or Android VM in Figure 43). VM Manager knows all UOS power states and notifies OSPM of SOS (Service OS in Figure 43) once active UOS is in the required power state. Then OSPM of the SOS starts the power state transition of SOS which is trapped to “Sx Agency” in ACRN, and it will start the power state transition. The ACPI table in UOS is emulated by Device Model. The Device Model knows which register the UOS writes to trigger power state transitions. Device Model must register an I/O handler for it. The ACPI table in SOS is passthru. There is no ACPI parser in ACRN HV. The power management related ACPI table is generated offline and hardcoded in ACRN HV.